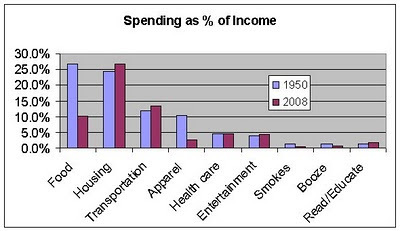 In 1950 American households spent about 37% of their income on food and clothing. That is certainly a lot of money to spend on food and clothing. Today we spend just 13% of our money on food and clothes. Thats 24% of our income that we're no longer putting into food and clothing. Thats a huge difference. I got the consumer expenditure survey data for 2008 from the BLS site. Ok, so 2008 is not exactly "today" but its the latest date they have compiled. The 1950 data is also from the BLS, I found it in this document on table 14. As you can see the amount we spend on food and apparel are both drastically down from 1950 to 2008. Other categories we generally spend a bit more today than we did in the 50's. 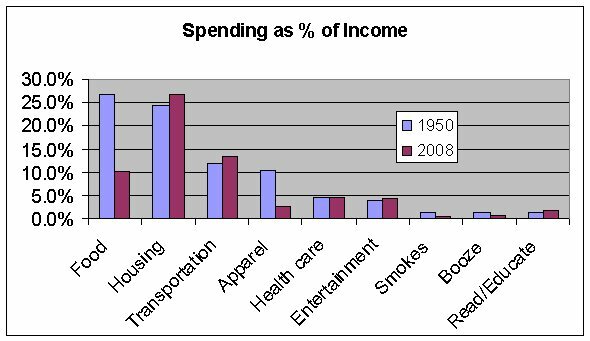 Our spending on housing, transportation, health care and entertainment as a % of our income is all up now compared to then. Its hard to see the columns for booze, smokes and reading / education. We spend a lot less on the vices nowadays. In 1950 we spent about 3.1% of our income on alcohol and tobacco and by comparison in 2008 we spent 1.2%. Our spending on reading & education went up a bit but it was almost all in the education category, probably due to much higher college spending.